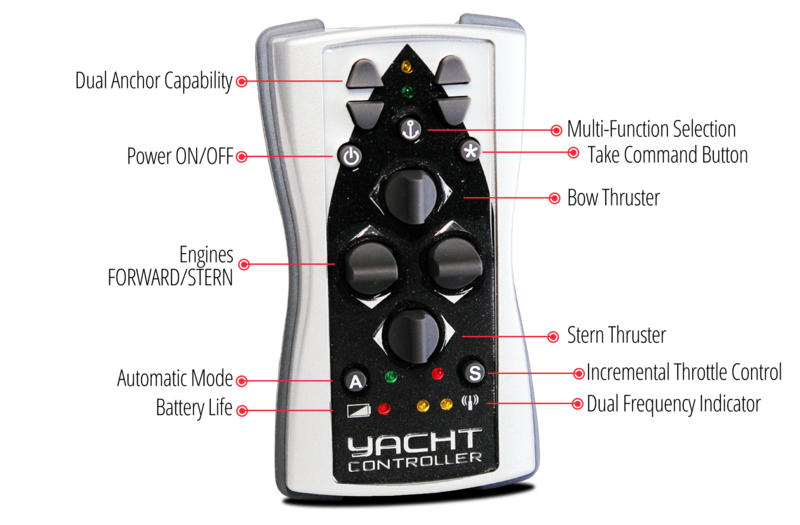 The ultimate in yacht control, Dual band Plus allows the user to set up to 5 parameters of power control with ramp-up time for the perfect control of the yacht in virtually every condition. Once the parameters are set, Dual band Plus is easy to use. Simply push the speed control button in quick succession for the parameter you want to use. So push 3 quick times for parameter 3. The remote will acknowledge your command by then flashing 3 times. If you want to change parameters, simply push the speed control the equivalent number of the parameter or simply turn it off to return to idle speed. 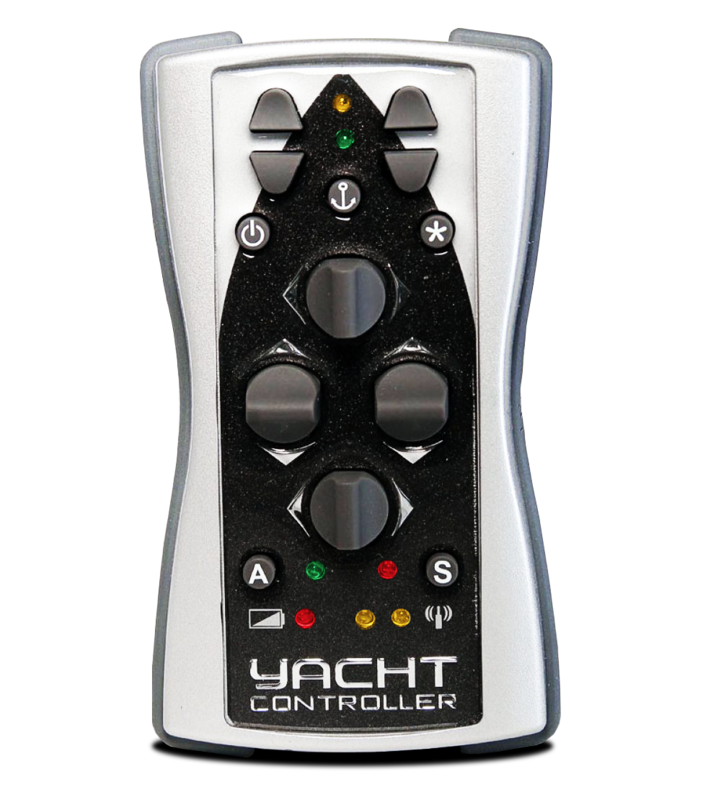 Yacht Controller Dual Band Plus unequivocally the perfect choice for wireless remote control on your yacht. You can set how much additional throttle you would like up to an additional 30% over idle for those especially windy or tidal conditions and the amount of time you would like the power increase to take hold. So for instance on our demonstrator vessel position 2 is 20% more power which takes 10 seconds to arrive at the 20% allowing a smooth increase in power from idle to the 20% increased power. Up to 5 of such parameters can be set including both the amount of final power and the time it takes to arrive there. The perfect solution for total boat control. Dual band + new automatic mode feature is a simple way to engage engine and thruster in combination with your remote. Simply press the A button to activate, the LED will light up confirming your choice, and then your thruster will run in conjunction with your engine to assist in moving your boat in the desired direction. This provides the ability for you to slide or “ crab” your boat sideways while also moving forward or astern to the dock, raft-up or mooring. To return to manual mode where only the engine will be engaged, simply press the A button again and the corresponding LED will turn off. Yacht Controller V.IPS employs automatic incremental throttle control via the Volvo system and can by placed into Hi docking mode with one push of the speed button. Yacht Controller, state of the art wireless docking control for stress free maneuvering enjoyed by more than fifteen thousand of our customers on more than 200 brands of boats.